I've been waiting for this reply for a while; the very last reply for my 2016 Christmas letters. There are a few Christmas letters I haven't gotten a reply to, but I'm not expecting anything from them. 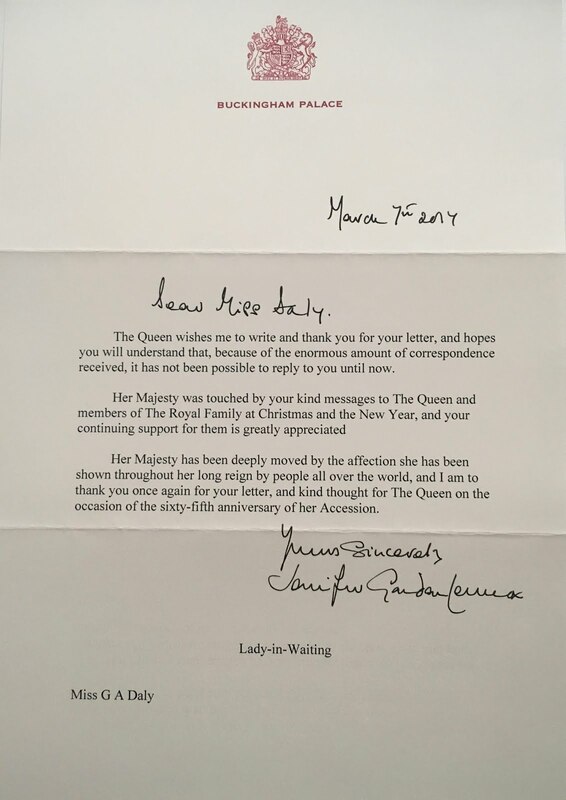 I had written to The Queen and Prince Philip at the end of November to wish them a very Merry Christmas! 3.5 months later I finally got my reply. The letter was sent from Buckingham Palace and was written by Mrs. Jennifer Gordon-Lennox. She is one of the Queen's Ladies-in-waiting and previously served the Queen Mum. This is the 1st letter I have gotten from her. It's a lovely letter. It's always nice when they mention what you wrote about (Christmas, Royal Family & Sapphire Jubilee). Which on this occasion makes me a little sad. I had written my letter the day Zara Tindall announced she was pregnant with her 2nd child. So I had of course begun the body of my letter congratulating them on the new addition to the family in 2017. And my letter was very focused on the Queen and Phillip's grandchildren & great-grandchildren. I was very excited about the news and as The Queen and Philip are getting older, I think more and more about next generations, and what they will be like. I think you can see a lot of the Queen & Philip in the younger generation. Of course, right before Christmas, it was announced that Zara had miscarried. So, what was suppose to be a very happy letter about family and children, is actually kind of sad 3 months latter when Jennifer is reading it. The reply also mentions my well-wishes for the Queen's Sapphire Jubilee which happened in January. I had mentioned that very briefing in the closing of my letter. I like to end my letters looking towards the future. It always interesting to see how you can mention something in one line at the end and that's what they had respond to. I had also talked about the repairs to Buckingham Palace i& the passing of the Queen's cousin Margaret Rhodes in my letter. Normally I would expect a Christmas reply to come much earlier, sometime in January or February, but the Queen's office has been very busy lately. They received a lot of mail for the Queen's 90th Birthday in April & June and I know they were still sending out replies for that in November. So they had a late start on Christmas and it took a while. And now I'm sure they are busy with the Queen's Sapphire Jubilee, then the Queen Birthday, and The Queen & Philip's 70th wedding anniversary later this year. So I would definitely not worry if your letter to the Queen take longer than the usual 1-2 months to get a reply.